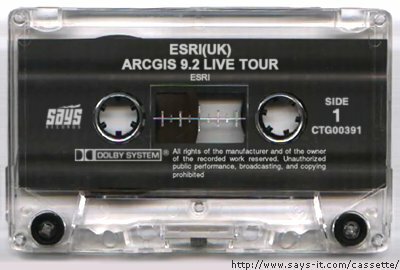 Comments Off on ArcGIS 9.2 UK Tour. OK So I’m officially useless at this blogging lark, its been a while and I’ve been a little busy but still no excuse. There have been a bunch of events that I failed to get to, I managed to miss both the AGI and the oracle spatial user group by being in Redlands catching up with the PLTS team, and getting a final sneak preview of 9.2. The agenda is still to be confirmed, but as its all about 9.2 you can probably expect to see lots about ArcExplorer and ArcGIS server. I would really recommend you try to get to one of these events, as 9.2 really is more than a “dot” release. It introduces some fundamentally new ways of sharing GIS data and functionality around organisations so if you are involved in planning, architecting, managing or building GIS systems its worth seeing what’s new. A couple of other events to note, If your in Birmingham for the 14th, you could also stay an extra day and catch the second day of the oracle spatial stream at the Oracle UK User group. Also the UK Geospatial mashup is happening on October the 20th along with an evening of musical mashups the night before where you can pit you DJ skills against our very own DJ CharlesK.